Brian Scovell, renowned for his many years as a journalist, is also a prolific writer and his latest venture, Our Beloved Cricket, is a happy account of his playing days. It is also, in his words, the most enjoyable book which he has written and it is easy to see why. Despite his disability with a stiff leg suffered during his early years in the Second World War, it never deterred the cricket-loving Scovell from playing as an opening batsman, slip fielder and organiser of The Woodpeckers. 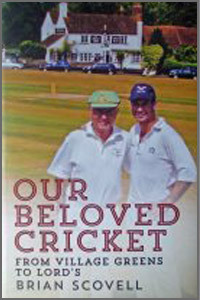 Brian recounts in this happy book many exciting games, oddities and the thrill of playing with many a Test cricketer. It is the stuff which many a village and club cricketer must dream of and will, I suspect, make many of us envy. Never, though, assume that, even with a stiff leg and journalistic responsibilities, that the games in which he played were anything but serious! The emphasis comes out throughout the book of a burning desire to win. Having been on many a Bill Frindall Maltamaniacs tour including one with Brian, I am particularly biased towards his chapter on Frindall or the Fuehrer. Another person like Brian who always wanted to win, there are some hilarious recollections which I can well believe. From inspecting rooms to the order in which people were anticipated to appear at breakfast – I was third as I recollect – Frindall was a fierce looking and fiery figure on the field and I had the dubious honour of being run out twice by the Bearded Wonder in one over the second time being as the last man standing. “ Sorry, old chap, I thought you were quicker than that as you’re younger” didn’t help the ignominy of ending up in a cloud of dust miles from the crease. Scovell picks up the essence of Frindall, a terrific host, beautifully. Scovell, no shrinking violet, tells of the persuasion used when The Woodpeckers’ fixture against Great Windsor Park CC was confirmed and later cancelled due to an error on behalf of the organisers and the pressure brought to bear as they would have been introduced to the Queen. He used his acquaintance with Royalty but, sadly, the decision stood. Scovell’s inimitable style comes through. In his previous book Thank You, Hermann Goering, I had written that, as a hypochondriac, I hadn’t much enjoyed all the pieces about journalists’ excesses and, in quite a few cases, early demises. Brian, teetotal and old school, enjoys, I suspect, telling us about his betes-noires and views and the book is much the better for them. He has been slightly let down by the proof reading in this latest book but there is much fun and enjoyment in this book which, I am sure, many village and club cricketers will enjoy – and envy. I look forward to his next writing mission.